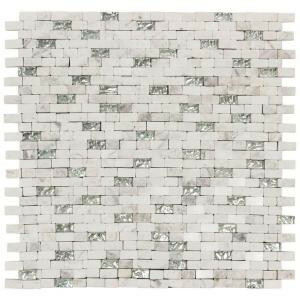 With its smooth, unglazed surface and its slight shade variation, the Jeffrey Court's Glass and Stone Mosaic Wall Tile can be installed alongside stone or ceramic field tiles (sold separately) to create a coordinated look. Mesh-mounted Mosaics can be used as a whole sheet or cut to make affordable feature strips. Recommend white “polymer-modified” thinset and non-sanded grout for best installation results. 1.06 square foot per piece, each piece sold individually. Piece weight equals 3.75 lb. Buy online Jeffrey Court Vision Mini Brick 11.75 in. x 12 in. x 8 mm Glass/White Marble Mosaic Wall Tile 99722, leave review and share Your friends.